High energy, classy live entertainment for upscale weddings and parties. This is what we are about. The Class is a truly unique wedding band experience. Boutique live entertainment your guests will not forget. An alternative to large, over-the-top wedding bands. We love doing weddings! Winners of Gigmasters' "Best of Award" in 2013, 2014, 2015 and 2016! Winners of Wedding Wire's "Couples Choice Award" in 2015 and 2016! Check out our LA Gigmasters account to see a ton of reviews! The Class played over 60 events last year! 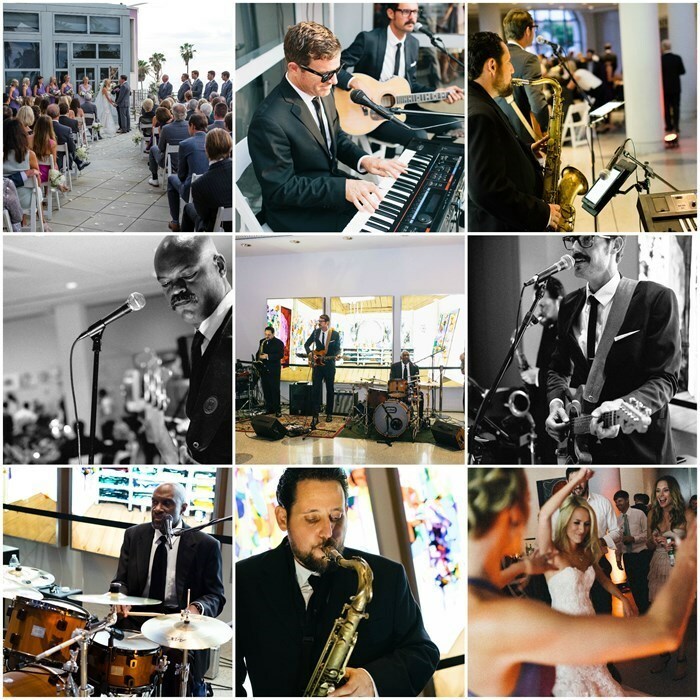 Hiring a band for your wedding, or event is risky business - we understand that. A band has the power to make, or ruin your event. You need a professional band. If you have looked around, you know, as we do, that most professional bands are big, cheesy and expensive. We believe we are the best and maybe the only band that does what we do - offer professional, tasteful and energetic live entertainment at a reasonable price! The Class provides a full sound typical of a much larger band, but without all of the extra volume. Their extensive song list, energetic approach and professionalism sets the The Class apart from other wedding/ party bands. The Class does it all. This band is extremely versatile, seamlessly moving between a wide range of styles: Motown, Dance, R&B, Pop, Funk, 60's and 70's classic rock, soul, reggae, modern rock, country, etc. The band has been playing music together for over 10 years. Brides! The Class will learn your first dance song, help you plan your reception and MC your wedding free of charge. The Class will work to understand exactly what you what you want and make sure you and your guests have the time of your lives! 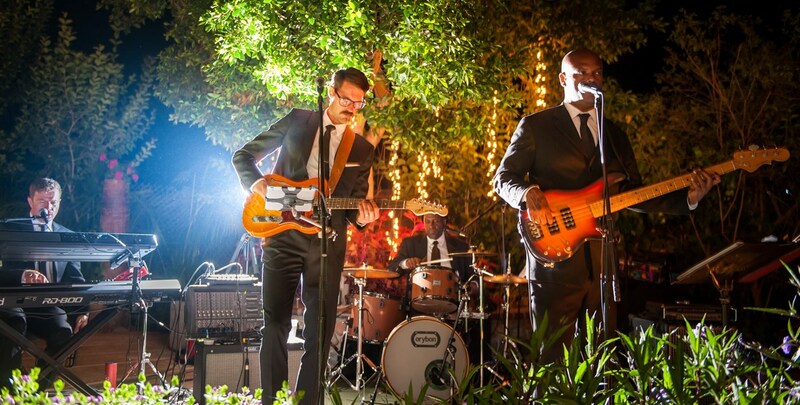 Their ability to play at a low volume, or rock at the end of the night, makes them the perfect band for any event: from weddings and private parties, to clubs and restaurants. The Class has fun, so the fans have fun. With all members singing, their diversity of styles, excellent song selection and band chemistry make them one of the top working bands in Southern California. The The Class offers MC services, sound setup and reception planning free of charge. AMAZING!!!! We absolutely LOVED The Class Band!!!!! Everyone was dancing and having a great time! They are so professional and talented!!!! Would highly recommend them for any event! If you want to make your event special, call these guys. We hired The Class for our Wedding this past Nov. I reached out and Gabe responded within a few hours. Gabe took the time to listen to our hopes for the evening, the primary being that people would just get up and dance. In the weeks leading up to the wedding, he helped us work out what the night would sound like. The set list blended contemporary and older classics that everyone could dance to. Mission accomplished. Everyone danced and everyone loved The Class. Gabe was a pleasure to work with, and my wife's maid of honor has even hired them for her upcoming wedding. I look forward to dancing with them again! LOVE LOVE LOVE working with The Class. From the pre-planning to the actual event- The Class was easy to work with, professional and delivered a great party. We hold an annual event every year and a majority of our attendees said this was the best party yet. This outstanding atmosphere was due largely to the awesome energy and talent of The Class. Thank you! I found The Class after wading through way too many terrible "wedding band" websites with 1990s graphics and promises of costume changes and backup dancers. I was about to give up when I Googled "non-cheesy wedding band that just plays great music" (or something), and found them. Well, this band is so good I almost don't even want to tell you so they will be available should I ever have another giant party and want amazing live music. They were so easy to work with, played the music we liked, and covered a wide range of styles. When I wasn't dancing, I was listening to my guests rave about them. Stop searching and HIRE THEM. You can thank me later. First off, We would like to thank Gabe, Ed, Robert, and Andy for travelling over 6.5 hours to perform at our wedding! Knowing that we were busy trying to 'herd cats', they immediately went to work setting up and getting familiar with the venue. Gabe stayed in contact with us throughout the entire process and made sure our expectations were being met. The music flowed seamlessly and we received so many compliments from guests. Kudos to 'The Class' for making our night something we and our guests will never forget! - Ben and Jen L.
I love this band. They played at my wedding over the weekend and were a huge hit. Every guest I spoke with raved about their performances. Not only were their sets on-point, but they dressed very, very nicely. They fit in perfectly with the wedding's vibe. I also appreciate that they worked the room and tried to get some interactive experiences happening. Gabe was also such a dream to work with; he is extremely accommodating and very supportive during the whole wedding song planning process. I'd highly recommend them for any event. We hired The Class Band to play at our daughter's wedding reception this past weekend. They did not disappoint! Wow!!! I cannot tell you how many guests complimented our band choice. They had the dance floor packed until the bittersweet end at midnight. They left us all wanting more!!! Bravo, guys...you appealed to every generation at our weeding, young and old and we cannot thank you enough. You killed it!!! The most entertaining, talented, accommodating, genuinely kind and incredibly fun group you will ever meet. Such a pleasure to work with. All of our guests had a blast, and were out on the dance floor the entire evening! From day 1 before we even booked them, Gabe was very responsive. He answered all my e-mails within 24 hours and answered all my questions thoroughly and honestly. On the day of the wedding their talent shined. They are amazing musicians. I myself am a musician and several of my invited guests were trained and accomplished musicians and song writer. Everyone raved about how much they loved the band. Their variety of music is incredible and their talent and skill are amazing. I would recommend The Class to anyone looking for a band that can play a wide variety of music. Having The Class band perform at our party was our priviledge! These guys are a definite "class act". Wow I was expecting a lot and they surpassed my expectations! Great playlist to choose from and they make you feel like you are a part of the process with choosing songs you want them to play and then on top of it they cater their break time song list to the same vibe so there is never a time at the party without music. We needed them to play at a sound level so we could all talk. No problem. Professional every step of the way, no drama, low maintenance and high caliber performance. These guys are the real deal and every one of them are super nice! Rock on! Please note The Class will also travel to Alhambra, Bell Gardens, Glendale, Huntington Park, Maywood, Monterey Park, Bell, Hollywood, Pasadena, South Pasadena, Montebello, South Gate, Burbank, Beverly Hills, Inglewood, Rosemead, San Gabriel, San Marino, Culver City, Downey, El Monte, Lynwood, Pico Rivera, Toluca Lake, Universal City, Willowbrook, Compton, La Canada, Montrose, North Hollywood.